It is simple, on the home page choose ‘I am a Guard’ and enter your information. Then follow the instructions to complete your profile. Nothing! The service is FREE for guards. What information do I put in? Once you have created your account you should upload all your permits and certifications, your employment history, and your resume. The more information you provide will allow recruiters to have a better understanding of who you are. Why do I need to record the video interview? This unique feature was developed so recruiters can get an impression of you beyond what is on paper. It is a chance for you to make a physical impression on recruiters. Recording a video interview will increase your chances of your profile being viewed. How do I record a video interview? From your profile page, click the "Take Interview" button. Review the instructions and tips provided and click continue to proceed to the practice interview page. 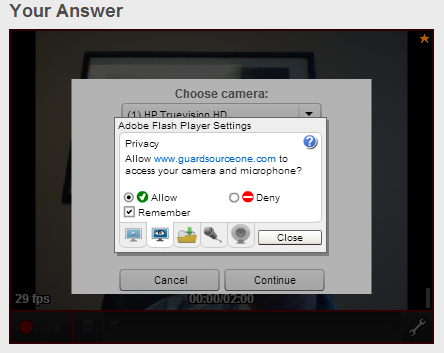 On the practice page, make sure you click the "Allow" and "Remember" boxes to enable your webcam. Then pick the microphone you want to use and make sure the sound levels show when you are speaking. 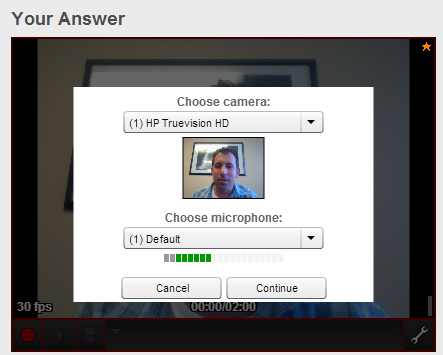 Once your webcam and microphone are set up, play the question and press "Record" to tape your answer. Press stop and let your video upload. When you are ready to record your real interview, be sure to click "SAVE" and wait for the "Save OK" message to appear. Who can view my video interview? The interview can be viewed only by you and a recruiter. In your profile page under the Employment History tab there is an option to upload your resume. In your profile page there are EDIT buttons in each tab and next to the header. What is Listed or Unlisted status? A guard has the option for his profile to be shown in the search or not. If the profile shows as Listed it is discoverable by searching. If the profile shows Unlisted it will remain private and only you will be able to view it. How do I change my profile from Listed to Unlisted or vice versa? Under the General Information tab hit EDIT and under Listing Status change from Disabled or Enabled to change the status. I got an Availability Confirmation email what is it? An Availability Confirmation email is an email sent by an employer interested in you. If you want the employer to contact you click on Available if not click Unavailable. Currently the service is free of charge. How do I find Guards? Once logged in, click on find guards, you can refine the search by utilizing the Refine Search Tools. What is a Guard List? A recruiter has the option to place guards that they like in lists in order to categorize potential employees. What is a ‘Check for Availability’ email? The recruiter can send an availability email to a guard he chooses to check if the guard is available to work. The guard receives the email and replies weather he is available or not. In return, the recruiter can the check the list to see who is available to work. How do I send a 'Check for Availability' email? To send an email, go to the guard's profile and click the 'Check for Availability' button at the top of the page. What do I need to do to send an Availability mass email?